is the title of a great post on the Ask 37signals blog. It’s great advice that I can fully subscribe to and recommend. Doesn’t really have anything to do with technology but is valid in a general sense. By the way, I did watch Steve Martin on Charlie Rose, one of my favorite TV shows for which I have a TiVo season pass. One of the best and most knowledgeable interviewer of all times. is the title of a column by Guy Kawasaki in AlwaysOn. It covers a study on the effectiveness of different kinds of word of mouth. I tend to agree with the results and Guy’s comments. The most effective WOM is by family, friends and colleagues, followed by regular folk and then pundits or those "in the know". If this was not the case, we’d be right back in the days of old media with the control over, or filtering of the message by editors and professionals. Those days are fast fading away as social media asserts itself. Wired reports and I’m sure few knew who first coined the phrase “weblog”. And according to the comments section another fellow claims to have started blogging from Japan in ’96. We sure have come a long way since then and the landscape of communications has changed significantly and will continue to change as social media will become even more mainstream and the percentage of contributors rather than readers increases. The evolution of the web continues and here’s a great take on what’s coming and how it will change the way we access and consume information. Tim Berners-Lee, inventor of the World Wide Web, today published a blog post about what he terms the Graph, which is similar (if not identical) to his Semantic Web vision. Referencing both Brad Fitzpatrick’s influential post earlier this year on Social Graph, and our own Alex Iskold’s analysis of Social Graph concepts, Berners-Lee went on to position the Graph as the third main "level" of computer networks. First there was the Internet, then the Web, and now the Graph – which Sir Tim labeled (somewhat tongue in cheek) the Giant Global Graph! 3. Graph: links relationships between people and/or documents — "the things documents are about" as Berners-Lee put it. "So, if only we could express these relationships, such as my social graph, in a way that is above the level of documents, then we would get re-use. That’s just what the graph does for us. We have the technology — it is Semantic Web technology, starting with RDF OWL and SPARQL. Not magic bullets, but the tools which allow us to break free of the document layer." Sir Tim also notes that as we go up each level, we lose more control but gain more benefits: "…at each layer — Net, Web, or Graph — we have ceded some control for greater benefits." The benefits are what happens when documents and data are connected – for example being able to re-use our personal and friends data across multiple social networks, which is what Google’s OpenSocial aims to achieve. "Then, when I book a flight it is the flight that interests me. Not the flight page on the travel site, or the flight page on the airline site, but the URI (issued by the airlines) of the flight itself. That’s what I will bookmark. And whichever device I use to look up the bookmark, phone or office wall, it will access a situation-appropriate view of an integration of everything I know about that flight from different sources. The task of booking and taking the flight will involve many interactions. And all throughout them, that task and the flight will be primary things in my awareness, the websites involved will be secondary things, and the network and the devices tertiary." I’m very pleased Tim Berners-Lee has appropriated the concept of the Social Graph and married it to his own vision of the Semantic Web. 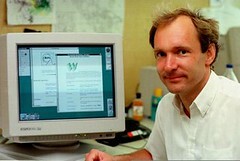 What Berners-Lee wrote today goes way beyond Facebook, OpenSocial, or social networking in general. It is about how we interact with data on the Web (whether it be mobile or PC or a device like the Amazon Kindle) and the connections that we can take advantage of using the network. This is also why Semantic Apps are so interesting right now, as they take data connection to the next level on the Web. Overall, unlike Nick Carr, I’m not concerned whether mainstream people accept the term ‘Graph’ or ‘Social Graph’. It really doesn’t matter, so long as the web apps that people use enable them to participate in this ‘next level’ of the Web. That’s what Google, Facebook, and a lot of other companies are trying to achieve. Incidentally, it’s great to see Tim Berners-Lee ‘re-using’ concepts like the Social Graph, or simply taking inspiration from them. He never really took to the Web 2.0 concept, perhaps because it became too hyped and commercialized, but the fact is that the Consumer Web has given us many innovations over the past few years. Everything from Google to YouTube to MySpace to Facebook. So even though Sir Tim has always been about graphs (as he noted in his post, the Graph is essentially the same as the Semantic Web), it’s fantastic he is reaching out to the ‘web 2.0’ community and citing people like Brad Fitzpatrick and Alex Iskold. Related: check out Alex Iskold’s Social Graph: Concepts and Issues for an overview of the theory behind Social Graph. This is the post Tim Berners-Lee referenced. Also check out Alex’s latest post today: R/WW Thanksgiving: Thank You Google for Open Social (Or, Why Open Social Really Matters). Hat tip to Stephen Joyce for bringing it to my attention. Check this out, pretty useful stuff. found this about The website marketing mind map on Hotelmarketing.com It sums up web based marketing in a visual and effective way. Bubble 2.0 – The Video…. Hat tip to Fake Steve Jobs for this one. and who can express it more succinctly than the Brits: SatLav scheme takes the piss out of Westminster as reported here by Absolute Gadget. And fear not Americans, as synchronicity would have it, a similar service is being announced in several North American cities today — including Atlanta, Boston, Brooklyn, Chicago, Cincinnati, Los Angeles, Manhattan, Minneapolis, Philadelphia, Oakland, Portland, San Francisco, San Jose, Seattle, Toronto, and Washington D.C. The new service is called MizPee (www.mizpee .com) from Yojo Mobile (www.yojomobile.com). Who will ever doubt again the utility of the web for all of us in one of life’s most dire situations…..! this is one more report, and by a respected firm like JD Power that shows Customer Satisfaction with Indy Travel Sites Declines. It’s fairly obvious by now, that the OTA have their work cutout for them if they want to keep their growth rates up and claim back market share lost to supplier sites. It’s no longer enough to just throw up a lot of product on their websites at the cheapest price. Increasingly web savvy customers expect more than that. Usability seems to be required and I assume relevancy in terms of what’s shown based on preference input. The more complex the travel plan gets, the more customers expect more than just a huge listing of pre-packaged vacations but the tools to self-design and assemble their dream vacation. It seems that Travelocity has caught on to that by putting more emphasis on the Dream – Learn – Plan aspect of leisure travel rather than the "from – to" model that is still prevalent. This study is just one more indicator that the bar is now higher and the low hanging fruit in easy online travel component sale has been picked. It’s on to web 3.0 tool development!